There are some notable candidates for the recipient of Elif Batuman’s Dostoevskian title. 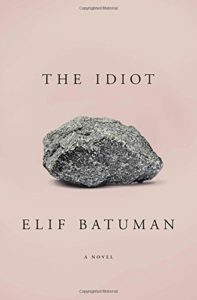 However, rather than focusing on any one idiot, this novel (Batuman’s first) investigates the particular idiocy of human ambition. Of youthful mishap. Of the relentless endeavoring to control or predict the course of our lives and identities. College novels are frequently the site where American writers go to inherit and riff on the Bildungsroman, or the novel of development. More often than anything, and more frequently now than before, stories like these also put the lie to college as a place of self-discovery. The raw materials higher education offers (at least in its liberal arts, humanistic varieties): arts, letters, “critical thinking,” are all the foundation of the Good Life — and yet all of them are frequently outpaced in a culture that neither understands nor cares for them. Language, literature, nationhood, why do all these organizing rubrics we get offered in college seem to both completely explain the world and be besides the fact entirely? What’s a young person to do? The Idiot asks these questions and takes them seriously enough to arrive at nothing final. But it does not ever brush these questions aside. In many ways, though, The Idiot, does map onto a prevailing mode in contemporary, of-the-moment fiction. The meanderings and marginality of a character in a large, impersonal, often bewildering order. Of being interchangeable, of being duped, of being beguiled (Ben Lerner, Zadie Smith . . . ). The missed connections. The leafy college setting. The book follows Selin, a freshman at Harvard (no coyness here) around the turn of the millennium, and her first forays with love and language. As a third culture kid, Selin finds herself marooned between her own American instincts about self-invention, the liminality and relative absence of her Turkish immigrant parents, and the appealing fatalism of the Russian culture and language in which she begins to surround herself. Batuman is realistic and unintimidated by the friction between cultures, each with differing ideas about self-invention and aspiration. Selin finds herself caught in a rather modern, multipolar situation: the American world eludes her; the Russian world intrigues her; the Turkish world—a sense of Turkishness—can’t really occur to her consciously. Everything the professors said seemed to be somehow beside the point. You wanted to know why Anna had to die, and instead they told you that nineteenth-century Russian landowners felt conflicted about whether they were really part of Europe. The implication was that it was somehow naive to want to talk about anything interesting, or to think that you would ever know anything important. While the novel foregrounds Harvard and environs, the university mostly serves as a mixing ground for a rotating cast of transnational elites. Their witty, referential dialogue would fit well in a Whit Stillman movie, albeit a more global, less nostalgic, less WASPy one. The few Americans Selin does meet are hapless professors, and some outside of the ivory tower (She volunteers as an adult education tutor). The story had a stilted feel, and yet while you were reading you felt totally inside its world, a world where reality mirrored the grammar constraints, and what Slavic 101 couldn’t name didn’t exist. There was no “went” or “sent,” no intention or causality — just unexplained appearances and disappearances. For an English speaker — the inheritor of a language so thoroughly premised on conditionals, on subjunctive possibility — a specifically Russian or Slavic sense of the world appeals in its certainty. It’s a certainty and fatedness which Selin seeks in the rest of her world, too — in the realm of feeling, in her social interactions, in romance. She befriends a group of international students, and finds a love interest in a tall, older Hungarian student named Ivan. Unadvisedly, she and Ivan conduct their courtship over the newly-issued campus email servers. She is greatly disappointed. She continues, following Ivan to Hungary for the summer to spend only a few hours with him, and to teach English in remote villages. This might be the idiocy of the title. Was it possible that the concern over the triviality-dungeon of conversation, which I had taken to be one of Ivan’s particularities, was actually part of the Hungarian national character? How did you separate where someone was from, from who they are? Like a Russian parable, Batuman is interested in telling and reiterating the central fact of human inadequacy. Idiocy. But, drawing from a British tradition of novel writing (from Eliot to Austen to Dickens), she is also careful about balancing her judgement with a sympathetic sense of condescension. The distance between the academic, measured language of Selin and her peers and the ridiculousness and naiveté of their lives and habits is consistent and charming. I end up feeling tenderly toward them because of the huge gap between their utter wrongness and the certainty with which it’s expressed. All the academic work going on around her, the inquiry, the passive aggressive competition, the intellectual vibrancy of her peers — all totally inadequate in her actual life and the questions it obliges. Not only does everyone and everything around her fail to provide answers, they also fail to care for her. Is the “idiocy” of the title Selin’s not knowing what is best for herself? Or the very idea that one can arrive at immutable self-knowledge on one’s own — the idiocy of the whole self-fashioning, educational ? Even while she flirts with hopelessness, Selin has enough native intelligence and inner resources to realize there’s yet more to come. Throughout the book, she defers her own sense that she will be a writer, despite her natural aptitude. She hesitates to enter a literary contest, and promptly wins first place. She doesn’t fit into the campus literary scene, but quite naturally conceives of everything through a narrative lens. It’s a somewhat evasive, humblebraggy maneuver on Batuman’s part. Art about failure, about idiocy — which so much of our art today is — always seems to have this same sense of disingenuousness about it; because the act of sitting down, purposing words to paper, being comprehensive in your attention to character and narrative, all of this requires a frankly superhuman ability, a very unnatural, unnaive, unidiotic attention that the great majority of people lack. This isn’t to say that artists are fundamentally different from you and me, except that like the rich, they simply have more of what it is that they have. Language, or culture, inflects and steers one’s character. Of course the obligation, the business of modern human life (and the bildungsroman as a genre, too) is to supersede one’s culture, by evasion or by force or by invention. Selin’s obstinacy, her general good faith or her aloofness often prevents her from doing this, but the hard-won wisdom she acquires by the book’s conclusion is a classically Socratic one: I know nothing — save that I know nothing. Nothing, not your first language nor your first love can entirely eliminate the gap between your imagination and the world, but ironically enough, it’s only through these things that you gain access to the idea that they might. Charles Thaxton is the web producer at JSTOR Daily, and a freelancer elsewhere. You can find him here, and on Twitter here.